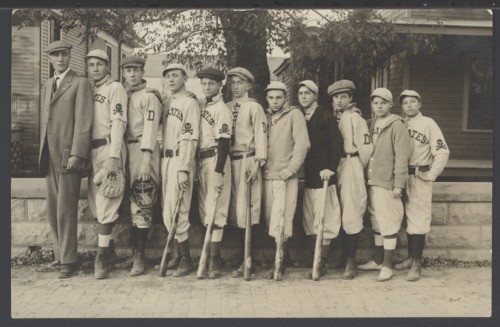 This postcard shows a high school baseball team from Dodge City. Ten uniformed players are pictured with their adult coach. The players are wearing two different styles of uniform. One displays DCHS down the jersey placket, with the letter "D" stitched on the sleeve. The other, the lettering of which is only partially visible, appears to bear the name "Pirates," and has the skull and crossbones symbol on the left sleeve. Names are given for ten of the eleven individuals, but it is not clear which of them remains unidentified. The notation accompanying the postcard names the following, from left to right: Hienie F. Schmidt; Leland Daughtry; George Pond; Tommy Streater; Addison Stafford; Charles Herzer; Billie Wilson; Louie Miller; Gene Fortney; John Cord. Team members not pictured include: Otto Streater; Sammy Stuubs; and, Joe Holfrietz.